Happy Bloggers Challenge Friday! Thanks to those who played along with last weeks Falling for You Challenge, it's always wonderful to see your take on the challenges. This weeks challenge is to use cardboard. Some ideas - cardboard embellies, books, recycle or alter a cardboard container or box. No stamping here, as I used some papers from Donna Salazar and Tim Holtz along with some Glimmer Mist Sprays and Distress Inks. 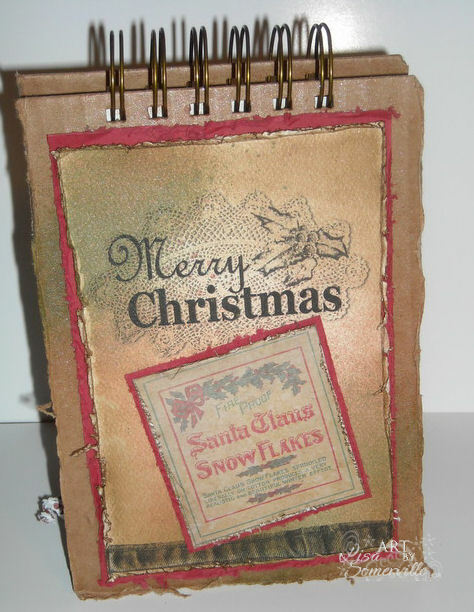 The edges are distressed with the Prima Distress Tool, the book is bound with the Bind-it-all. If you'd like to play along with this weeks Bloggers Challenge, please link back to this post on your blog and mention you created your card for the Bloggers Challenge Cardboard Challenge. Please add your link using the Link Tool below, your link should be a direct link to your Bloggers Challenge Post, use your name as the Title. Please do not link to cards that were created prior to the challenge date. Entries not linking properly, or backlinked will be removed. If you have the captcha enabled on your blog, please consider turning it off, as it makes it so much easier to leave comments. NO STAMPING?! Gorgeous book. I was trying to figure out whose stamps those were as they were so pretty! What a great book. Love how you did your own binding with cardboard. Very nice. Great book, love that you didn't use any stamping! Such a great notebook!!! Love the Christmas theme - would work great for wish lists or your shopping list! Great little vintage feel notebook! Love all the destressing! Happy Friday! 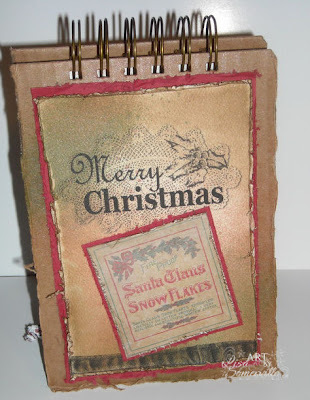 Wonderful project- the Christmas papers are awesome- love the vintage feel to your notepad! Wonderful notebook. Love the vintage look. Great use of those papers; it looks stamped. Love your book, Lisa. Looks fabulous!! Very nice project. Love the "Vintage" look you created. No stamping is sometimes fun to do. Wonderful gift idea....its good to not stamp sometimes ...note the word sometimes! Lisa, this is so pretty! I can't believe there is no stamping on it. You did a marvelous job on this! Beautiful!